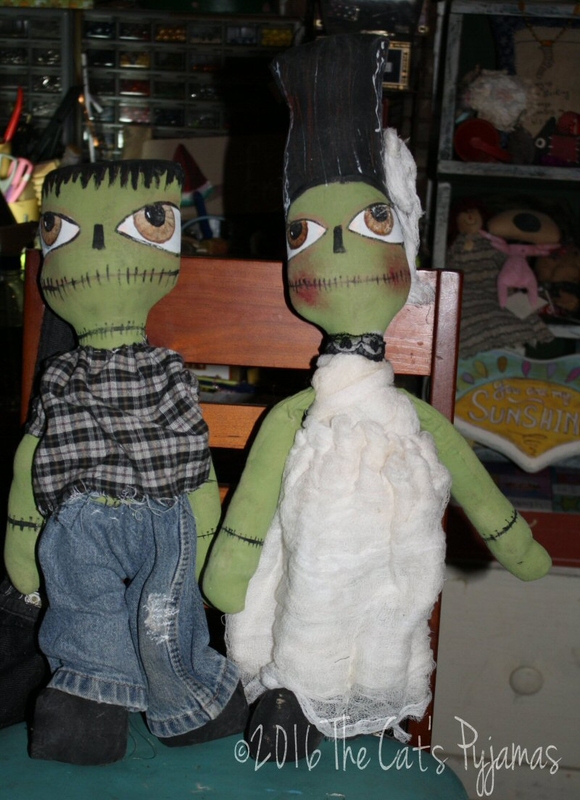 Frankenstein's Monster & his Bride! Check out this cute couple! They are both made from muslin and hand-painted. They're both a nice sickly green color with huge brown eyes. Frank has on pants made from an old pair of jeans and a plaid shirt. The Mrs. has tall hair, a dress made of cheesecloth and black lace around her neck. He measures 18.5" tall and she is 22" tall. Both come signed & dated with hangers on back. You can buy one or both. This raggedy ol' friend is made of coffee stained muslin and her features are all hand-stitched. Her hair is a dark red wool yarn that matches her red gingham dress. Her dress has antiqued lace and she is wearing a scarf made of pieces from a really old quilt. Her legs and her feet are hand-painted & distressed. She comes signed & dated with a hanger on back. She's just under 16" tall. Just guess what I made Ol' Red out of....an old Elmo Halloween costume! I've been saving it for a while, trying to decide what to make from it. This cute little devil kind of reminds me of a creature I used to see on a Bugs Bunny cartoon. He face is made from two mismatched black buttons and black lace. He measures 9" tall and would make the cutest one of a kind throw pillow! Darla was featured in Prims magazine...still a favorite of mine. 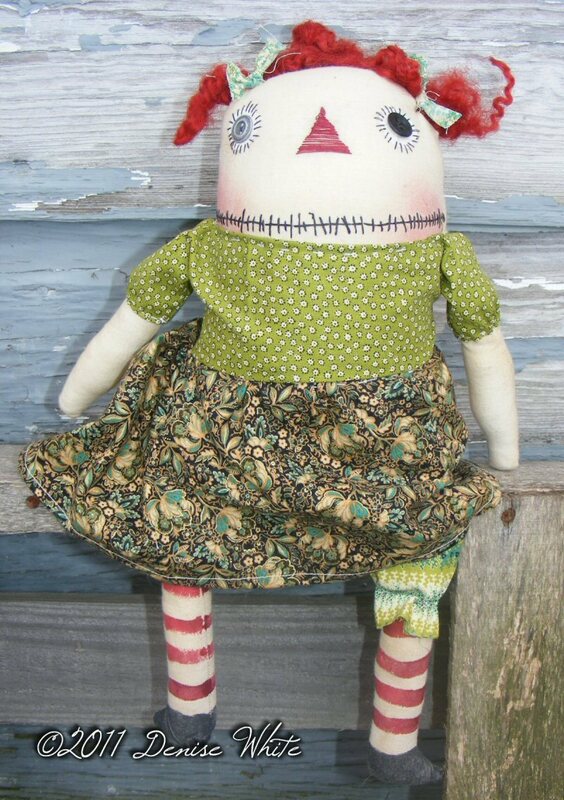 She made of coffee stained muslin with hand-stitched facial features, hand-painted legs & shoes and she has bright red dyed wool. She's wearing a dress from two different fabric, bloomers & bows in her hair. She's about 17" tall, signed & dated with a hanger on back. 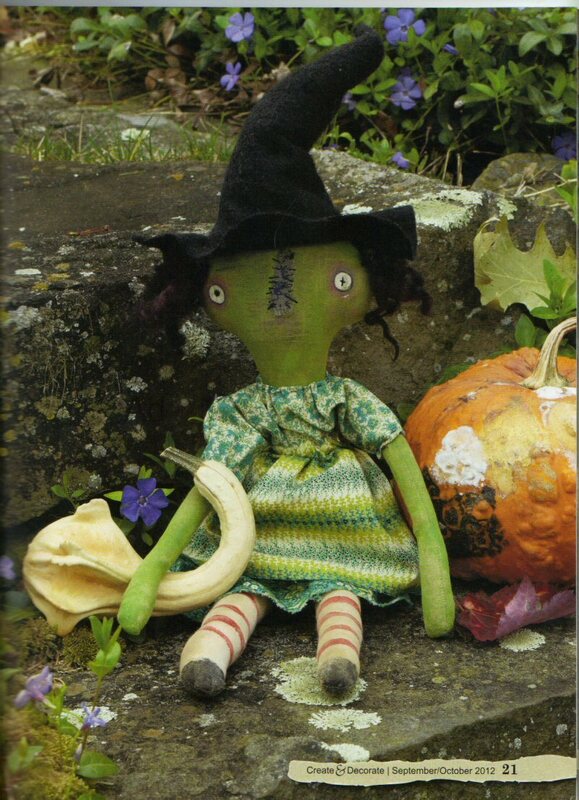 Witchy Woman doll, as seen in Create & Decorate magazine. about 22" tall. Made of painted & aged muslin. Comes signed & dated.